We have an active and enthusiastic French Student Society during the academic year. Visit their Facebook page or email them at francais@dal.ca to join their mailing list. 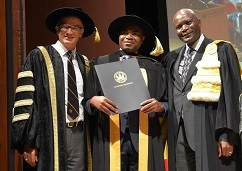 Congratulations to Henri Biahé, picturered here with his supervisor, Dr. Raymond Mopoho and President Florizone. 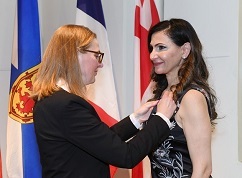 A ceremony to celebrate the investiture of Madame Taghrid Abou Hassan as Knight into the Order of Academic Palms of France was held on May 23rd. One of the oldest civil awards in existence, the decoration was first created by Napoleon to honour members of the French Imperial University. It was re-instituted in 1955 by René Coty, the President of France. Initially awarded only to French professors, it now pays homage to French nationals as well as foreigners who have made a significant contribution to the diffusion of the French culture around the world. Félicitations to Dr. Irène Oore - winner of the 2016 Prix Marguerite-Maillet. 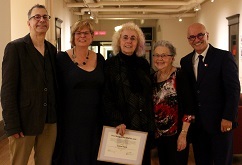 This annual prize recognizes outstanding contributions to the development and study of Acadian and French Canadian literature. To celebrate the end of the semester as well as the 200th anniversary of Dalhousie, the French Department with the French Society are hosting a talent show! Any kind of talent is welcome, but we ask that the ones requiring speech such as poetry reciting and singing be done in French. Come by to chat with teachers and French students, and see what amazing things students can do! We'll have prizes for all participants (plus some for the public's favorites! ), and a light buffet will be served afterwards. If you are interested in participating, contact us on Facebook or at francais@dal.ca ! 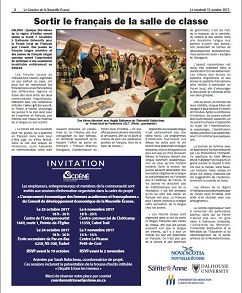 Pour célébrer la fin du semestre ainsi que le 200e anniversaire de Dalhousie, le Département de français avec la Société française organisent une soirée de talents! N'importe quel talent est le bienvenu, mais nous demandons que ceux qui requièrent la parole tels que réciter de la poésie ou chanter soient en français. Venez discuter avec vos enseignants et d'autres étudiants de français, et voir les choses incroyables que des étudiants peuvent faire! Nous aurons des prix pour tous les participants (plus d'autres pour les préférés du public! ), et un buffet léger sera servi ensuite. Si vous êtes intéressé à participer, contactez-nous sur Facebook ou à francais@dal.ca! Cet événement aura lieu le vendredi 30 novembre, de 16h30 à 19h00, à l’International Center. Jean-Marie Watonsi successfully defended his PhD thesis titled "LA TRIBUNE DES ARTS ET LETTRES: UNE PRODUCTION DU SAVOIR LITTÉRAIRE AFRICAIN ANALYSE DES CHRONIQUES DE CAMEROON TRIBUNE 1975 à 1984​​​" on June 25, 2018 - félicitations! 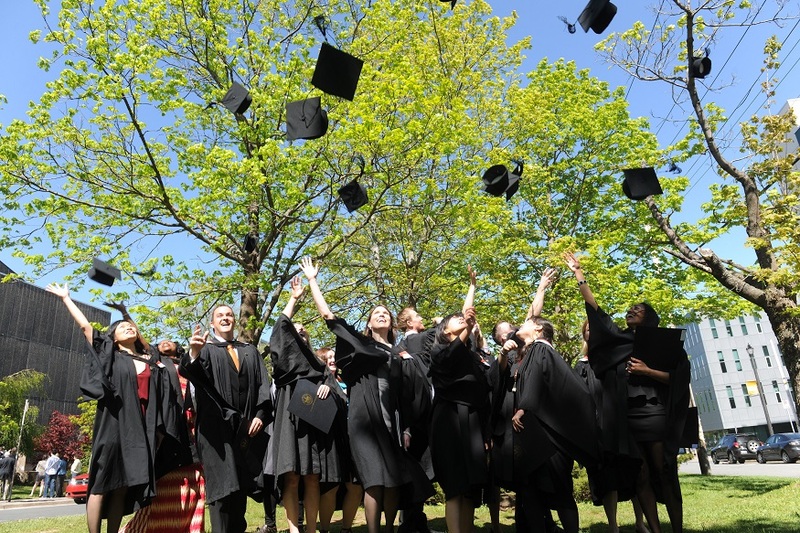 Congratulations to all of our 2017/18 graduates! We are very proud of your accomplishments and we wish you all the best. Shashi Bhat, a former colleague in Dal's English Department, has won this year's Writer's Trust/McClelland & Stewart Journey Prize for her short story, "Mute"
Dal alum Jeremy Dutcher (Music/Social Anthropology) is the 2018 winner of Canada’s prestigious Polaris Music Prize.